We started Seabright because we think there’s a better way for user experience companies to behave: build what you design. After all, it’s not actually designed until it works. We aren't in the deliverables business or strategy business. Deliverables and strategies are simply a means to an end. When you work with Seabright, you receive a fully designed, working product that will grow with your business. Over the past fifteen years we have designed and built commercially successful apps and services in social media, E-commerce, games, travel, information retrieval, data analytics, medical, finance, real estate, sports, and retail. We have the chops to bring any UI to life at production scale, and our work is used by tens of millions of people every month. The big takeaway from this project for us is that runners can be a nerdy bunch. No matter where in the world, runners love collecting data, getting feedback and analyzing their running. We partnered with AQ (Tokyo) to redesign and build a global training service for ASICS (Amsterdam/Kobe), and their legions of avid running customers. The ultimate goal? We want to make you a better runner. 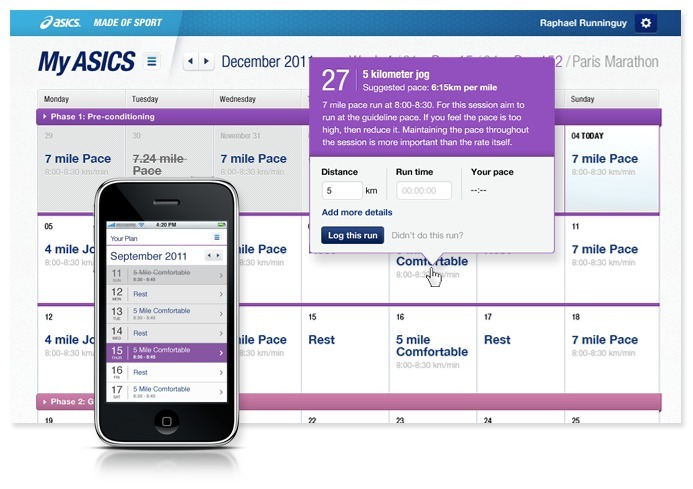 The new service is designed to allow runners to create custom, science-based training plans, and analyze their performance as training progresses. The service works as an integrated experience, including desktop and mobile web products. It's seamless, and designed to work no matter where you are. This was an exciting project for us, and working with a globally distributed team made for a great learning experience. We're excited to see the new products roll out around the world in 2012.